A. Peripheral blood leukocyte from an AIDS patient producing HIV. There are several particles budding from the periphery of the cell. Other virus particles cluster outside the cell membrane. 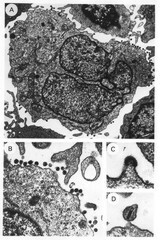 (x30) b. Enlargement of far right center area of top photo showing mature HIV particles. (x90) c. HIV particle budding from cell membrane. (x200) d. Mature hiv particle with characteristic core. (x200).